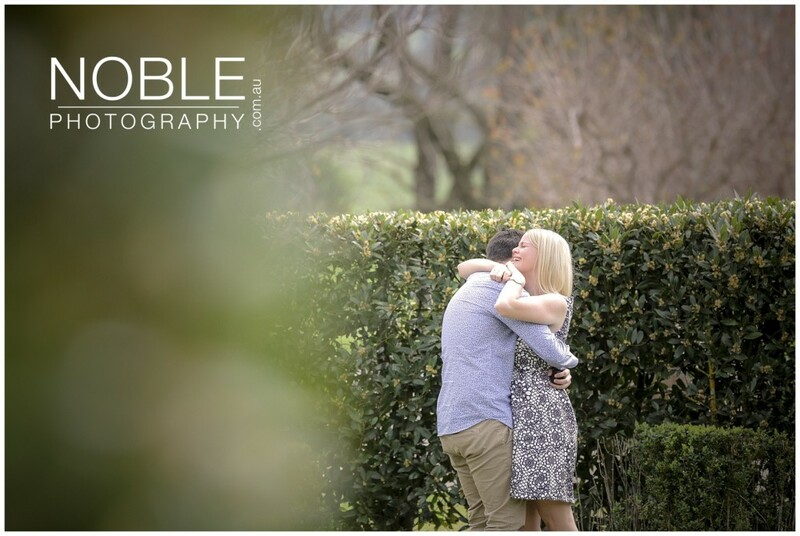 Paul’s proposal was beautifully planned, he had told Elise’s girlfriends that they had a Groupon deal for a lunch in the Yarra Valley, and that a driver will come and collect them individually to drop them out to the beautiful winery, Yering Station in the Yarra Valley. I met Paul at Yering station 30 minutes before Elise was scheduled to arrive, and discussed where I would be and the general plan of how this was to all unfold. In the next 20 minutes I captured the details and the venue, and the engagement ring, along with setting up a discrete video camera. The plan was perfect. The driver was to let Paul know when they were a few minutes away, and that the car will pull up at the end of the driveway, giving me a clear photo of Elise getting out of the car. As she walked down the path, Paul would be hiding behind a private hedge surrounding a single tree, complete with an amazing engagement ring, flowers, cheese platter and of course Champagne from Yering Station! Just before the car approached a group of Asian tourists arrived and were about to walk down the path where Paul planned to propose, thankfully they were Chinese and I was able to communicate with them and explain the plan and they were more than happy to view the Winery from the other way first. They were both excited for Paul and shocked with how fluent I am in Chinese. This is yet another time where speaking a few languages has been a godsend! Anyways, The car came into sight and we could see the car slowing down to turn off the highway into the driveway of Yering Station. We all hid / took our places….. 30 seconds later a black BMW sedan pulls up and the driver let’s a very unsuspecting Elise out of the car, she gets out and starts walking down the path…. I take a few shots from a distance, using a very long lens then subtly head back into the my discrete spot. Capturing Paul nervously waiting on the other side of the hedge. Elise strolled along the path looking forward to meeting her girlfriends at the restaurant ahead of her! “Elise” Paul stands up and says! “Paul!” what are you doing here???? Paul drops to one knee, pulls out the ring and proposes to Elise! A picture tells a thousand words, I was able to be distant enough to make the proposal intimate and still fairly private whilst capturing these emotional and beautiful images for them to share with their family and friends. These photos have affected many of Noble Photography’s followers! There is something about witnessing a Wedding Proposal, thats so special that even people who don’t know the couple are effected! I feel very privileged to capture this occasion to help Paul and Elise share with all! Congratulations and Thank-you for having me there! Enjoy!Thanks for booking me already for your wedding, that’s not been organised yet! 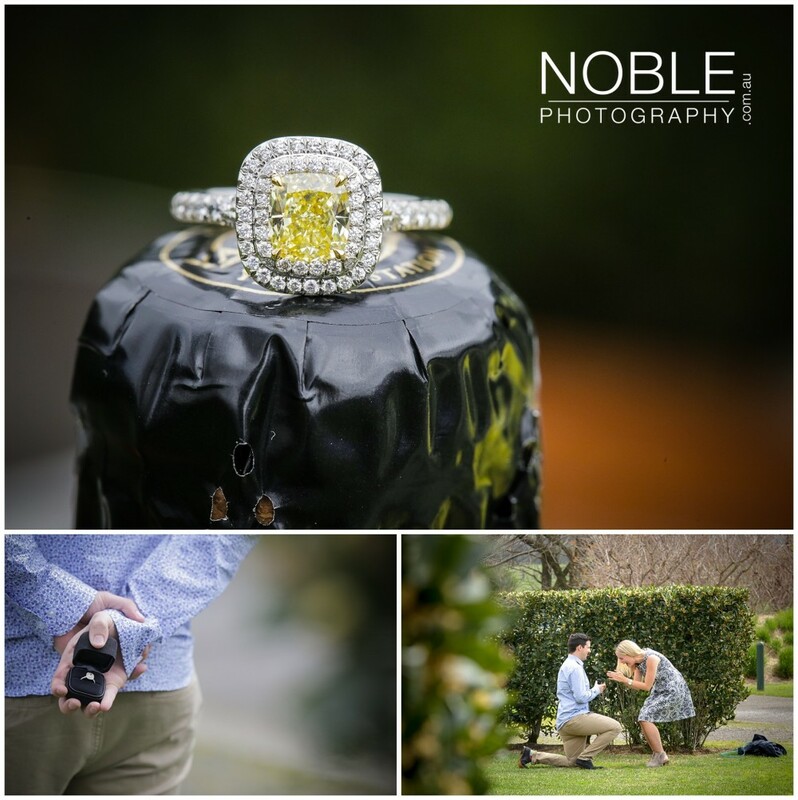 Look forward to catching up soon, and showcasing your amazing wedding proposal! 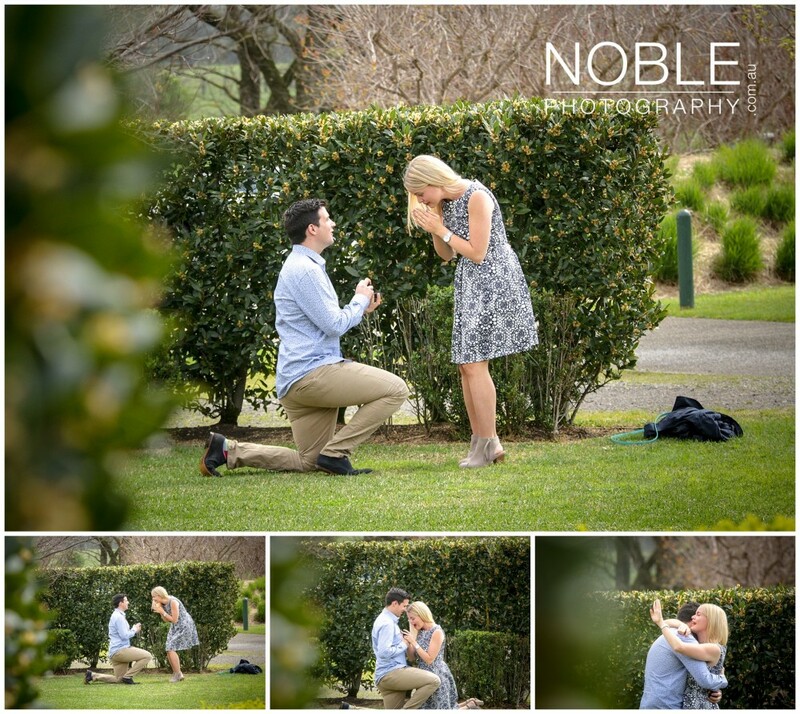 Wedding Photography proposal – YES! Proposal and Engagement Photography shots and full story coming soon. Congratulations again and thanks for having me capture and document such a special moment in your lives!